The Hall School of Music Orchestra program was founded in 2003 and comprises the most advanced students of the school. The program features three orchestra which are outlined below. All rehearsals take place on a Saturday. Featured repertoire includes music from the Baroque period and the string orchestra literature. Guest artists are invited to solo with the orchestra and have included young musicians who perform with Camerata Chicago and have performed on the well known National Public Radio show From The Top. The orchestra program is directed by Drostan Hall. The Baroque Festival Orchestra is the top level ensemble and features the most advanced highschool students. This group achieves a very high level of music making and produces a professional sound. 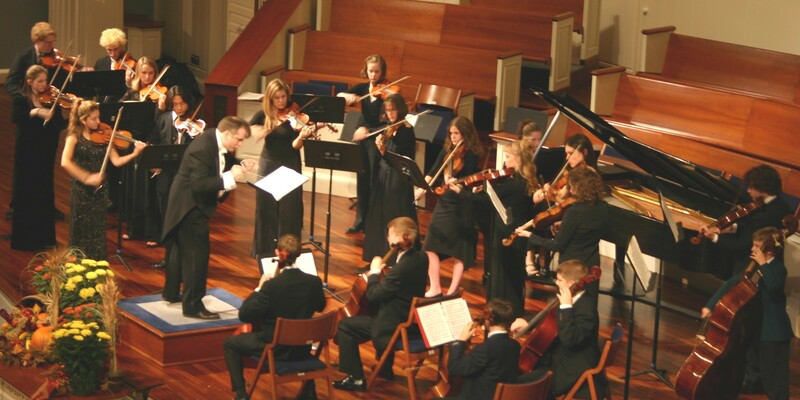 The Baroque Festival Orchestra meets on Saturday afternoons from 2:30 - 4:30 pm at College Church. The Chamber Orchestra is for high school level students and meets on Saturday mornings from 10:00 - 12:00 pm at College Church. As with all the orchestras the discipline of uniform bowing, intonation and precision in ensemble playing are highly emphasized. The String Training Orchestra is for intermediate level students and meets on Saturday afternoons at 1:00 - 2:30 pm at College Church. This ensemble introduces the concept of orchestral playing, including the important aspect of the different sections of the string orchestra which are 1st violin, 2nd violin, viola (violin 3) and Cello. (Bass). The discipline of uniform bowing, intonation and precision in ensemble playing are highly emphasized.